the right (Password, Whiskey, Combust and Thirteen). As always, the shadows are very blendable with great colour pigmentation and staying power. There can be a little fall out but nothing to complain about. So far my favourite shades are Dirty Sweet and Combust. I already have the other palettes so I did question whether I needed this palette, but being a beauty lover I knew I had to add it to my collection. 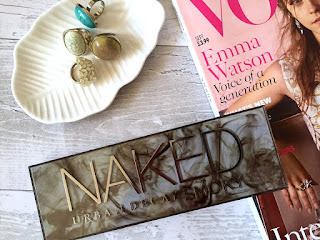 This is a very versatile palette which covers a real range of looks from your everyday neutral matte right through to brown, grey, purple smokey eyes. I absolutely LOVE the packaging of this palette. I have found that each time a palette comes out it improves in quality and appearance. I was lucky enough to get mine with a £10 off code for feel unique which made it a bargain at just £28! In my next post I am going to be testing this palette out to create four smoky eye looks- please see Thursday's post for more!